Kilmer, as FBI agent Ray Levoi, is partly Caucasian and partly Sioux Native American. The FBI sends him to work a case in the South Dakota Badlands, on Sioux land, to create a favorable PR image. He joins Shepard, as Frank Coutelle, a weathered FBI agent who’s been in the Badlands long enough to know everyone, as well as know the system well enough to make it work for him. Greene, as Walter Crow Horse, is a Sioux police officer and eventual bridge between Levoi and the local people. At first, though, he doesn’t make it easy for Levoi. And Levoi, with cockiness and constant gum-chewing, doesn’t even want Crow Horse’s helpful overtures. Naturally, there’s a lot of tension between the two and lots of middle fingers thrown, which eventually becomes comic relief. Levoi and Coutelle aren’t just investigating a homicide, though. There’s complicated social and political movements involved, making the case hard to close. Coutelle wants a quick end and is satisfied to suspect Jimmy Looks Twice, played by John Trudell, who embodies the ultimate Native American warrior, at peace with continuing his people’s sometimes armed and violent struggle to protect their land, resources, and culture. Crow Horse, with the help of Grandpa, played by Ted Thin Elk, is searching for real answers and the two continuously, somewhat humorously, and with a serious dose of bartering, visions, and meandering directions, slowly pull in Levoi. The modern relevance of the story is that Jimmy Looks Twice is a known member of ARM, a slight disguise for AIM, the American Indian Movement. In 1973, two hundred members of AIM seized the South Dakota town of Wounded Knee in protest against federal government policy regarding Native Americans. They held the town for 71 days. While not identical to modern events, this is reminiscent of the recent and ongoing protests in North and South Dakota against the Keystone Pipeline, where Native Americans are standing up for their rights, their land, and their water. Thunderheart fictionalized several events which happened in the 1970s, including the insurgence of Native American pride and activism which captivated national attention, but also water rights, government and tribal leadership corruption, and the constant violation, by the US government, of agreements with Native Americans. Several people were injured and the town of Wounded Knee was so shot up that it wasn’t re-inhabited until the 1990s. Naturally, the movie is a romanticized version of events. In fiction, Levoi embraces his Sioux ancestry – making the useful visual transition from Ray-Bans and suits to jeans and a simple t-shirt in just three days. Corruption is exposed and, it’s assumed, corrected. The good guys, ARM, keep up the fight and reclaim…something. It’s not clear that the land will be cleaned up nor the corruption brought to justice, but the end of the movie has a satisfying, Hollywood ending. These days, Native Americans are fighting for their land and water much more peacefully. Many people have joined the encampment in Cannonball, North Dakota, which has had varying levels of occupancy for a year. The movie Thunderheart is a useful, albeit fictionalized, reminder that Native Americans have been fighting to reclaim their land, their rights, safe water, and dignity next to the American/white man’s systems for centuries. I watched this movie at Murray State University as part of Cinema International’s spring line-up. I’m surprised the movie hasn’t surfaced as a pop culture reference amidst the Keystone and #NoDAPL struggle. Luckily, on this campus, we can see the parallels between past and present US-Native American relations and acknowledge that the struggle is real and long-term. 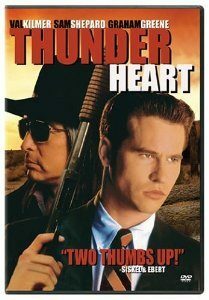 On Rotten Tomatoes, Thunderheart earned a 78% rating. Roger Ebert reviewed the movie for the Chicago Sun-Times and gave it a 3.5 out of four stars. It was humorous to read Ebert’s comments: he was so confused by Kilmer’s look in the movie. He barely recognized the actor until a few scenes in. But then he mentioned seeing Kilmer in The Doors previously, which gave us Kilmer as the shaggy and lanky Jim Morrison, not the polished, Ken doll we know Kilmer as today. I found the film to be interesting, wonderfully paced, and compelling. All of the actors were very good, if also stereotyped. There were surprises and plot twists, alongside a few predictable outcomes. The film has aged very well, even if all the actors have now gained 25 years. You can watch the preview here. Have you seen Thunderheart? Do you remember it from the early nineties or did you watch it more recently? Please share your thoughts below!